Weekly services take place on a Sunday morning at 11am. During our Church renovation the services will be held in the Church Hall directly opposite the church. Families with children who would like to attend Kids Club or Sunday Tots are welcome to meet in the Church Hall at 10.45am. All welcome. Everyone is invited to stay for tea and coffee after the service. Due to renovation work due to take place in St George’s Church during 2019, Sunday morning services will take place in St George’s Church Hall starting from Sunday 6th January 2019 until further notice. Keep up to date with the Church Development Project by reading the projects page on the website and by viewing the photo galleries. The photographs below will also be updated as the project progresses. Weekly services take place at 11am on a Sunday morning. Children of all ages are invited to attend and are also welcome to attend Kids Club/Sunday Tots in the Church Hall from 10.45am. Everyone is welcome to enjoy a cup of tea/coffee and fellowship in the Church Hall immediately after the service. Alternatively, St George’s Messy Church takes place in the Church Hall on the last Wednesday of each month from 3.45pm until around 4.45pm. This is an alternative mid-week, late afternoon, non-traditional church experience for people of all ages. St George’s also hosts prayer events, bible study classes and themed services/concerts at different times. Please be part of it. St George’s and its members are well known in the local community and are keen to welcome anyone looking for faith, fun and fellowship to be part of the St George’s community. There is always something happening at St George’s including weekly services, social events, concerts, coffee mornings, craft fairs and quiz nights to community based fundraising events ranging from ceilidhs and bike rides to fashion shows and pop-up shops! We also do what we can to support the local community and international aid through various initiatives. Within St George’s we host a number of regular groups, events and activities and welcome members and non-members to come along. Groups include everything from a toddlers group, reading clubs and a badminton club to The Guild and a craft group. The Church Hall is located directly opposite the church and is a modern venue for meetings, events and social gatherings. It is a large, clean and airy space with a fully fitted kitchen, toilets, disabled access, a main hall, a stage room and a club room. It is situated in beautiful surroundings with plenty of parking and is well used by church groups as well as community clubs and organisations. St George’s welcomes enquiries from any organisation looking for affordable venue hire in Dumfries for one-off events or block-bookings. 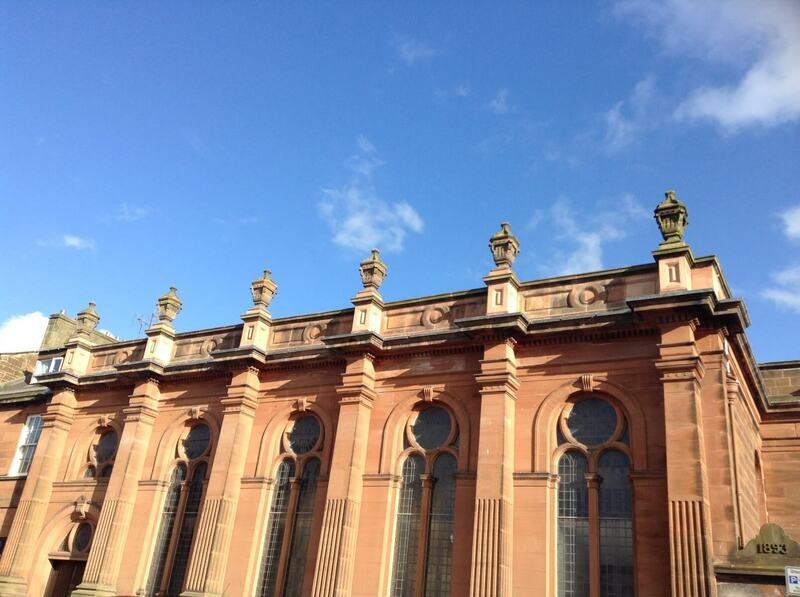 The Church itself is also used to accommodate services, meetings, concerts and events in Dumfries town centre. Car parking spaces are also available to rent on George Street, Dumfries. Get in touch if you would like to work with us or use our facilities. Looking for something to do with the wee ones over the Easter Weekend? Come and join us for Easter fun in the church hall on Saturday 20th April from 2-3pm. Things are heating up in St George's again! The Church Development Project is going well. Here is a wee glimpse of the the underfloor heating being installed. Our Thursday morning bible study group is currently studying the book of Esther, this group meets on Thursday morning at 10.30 am, (at present in the stage room). Face painting, Easter egg luck dip, card making and help us to decorate our flower cross! St George's Church is a community of great people who simply want to make a difference in the world. More progress at St George's today. As part of our Faith, Fun, Fellowship and Fundraising in February project, the children from St George's Kids Club and Sunday Tots decorated their own banks and are now on a mission to fill them with brown pennies for church funds. With the help of the congregation, the children are working together to fill their collection bucket and they are off to a good start! Thank you to everyone who has donated pennies so far! Things are heating up in St George's again! The Church Development Project is going well. Here is a wee glimpse of the underfloor heating being installed. Esther throws up many situations and challenges that are still ongoing in life today, thoughts and discussion are encouraged and a well welcome awaits. A life-builder evening bible study will commence on Tuesday 26th February 7pm with the subject being Peter (Learning to be like Jesus). This group will run fortnightly over 6 sessions and is a perfect chance to start studying the Bible or to revisit it. Please contact June Marchbank 01387 252522 for more details.